The US Defense Advanced Research Projects Agency (DARPA) has selected Aurora Flight Sciences to develop a prototype for the agency’s Vertical Takeoff and Landing Experimental Plane (VTOL X-Plane) programme. Under DARPA’s phase 2 contract for VTOL X-Plane, Aurora Flight Sciences aims to develop an unmanned aircraft prototype, which has VTOL capabilities and can achieve a top sustained flight speed between 300k to 400k. The proposed prototype will be designed to increase aircraft hover efficiency from 60% to at least 75%, and provide a more favourable cruise lift-to-drag ratio of at least 10, up from 5-6 than other VTOL aircraft. Further, the prototype will have the ability to carry a useful load of at least 40% of the vehicle’s planned gross weight of 10,000lb to 12,000lb. DARPA programme manager Ashish Bagai said: "Just when we thought it had all been done before, the Aurora team found room for invention, truly new elements of engineering and technology that show enormous promise for demonstration on actual flight vehicles. "VTOL X-Plane’s radically improved flight capabilities could lead to revolutionary advancement of the US military’s future mission capabilities." "This is an extremely novel approach. 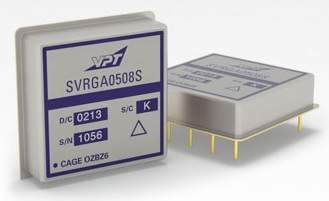 "It will be very challenging to demonstrate, but it has the potential to move the technology needle the farthest and provide some of the greatest spin-off opportunities for other vertical flight and aviation products." Aurora’s Phase 2 design for VTOL X-Plane intends to feature two large rear wings and two smaller front canards, a turboshaft engine with ability to provide 3MW of electrical power. The proposed aircraft design will also have the ability to fly fast and far, as well as hover when required, and complete different missions without the need for prepared landing areas. The technologies the VTOL X-Plane programme aims to develop could also apply to manned aircraft. DARPA plans to conduct flight tests of the new programme by 2018. Among the design advances to be included in the technology demonstrator in its Phase 2 design comprise electric power generation and distribution systems to allow multiple fans and transmission-agnostic air vehicle designs; modularised, cellular aerodynamic wing design with integrated propulsion that allows the wings to work efficiently in forward flight, hover and when transitioning between them; and over-actuated flight control systems, which could change the thrust of each fan to boost manoeuvrability and efficiency. Aurora chairman and CEO John Langford said: "If successful, VTOL X-Plane’s radically improved flight capabilities could lead to revolutionary advancement of the US military’s future mission capabilities." 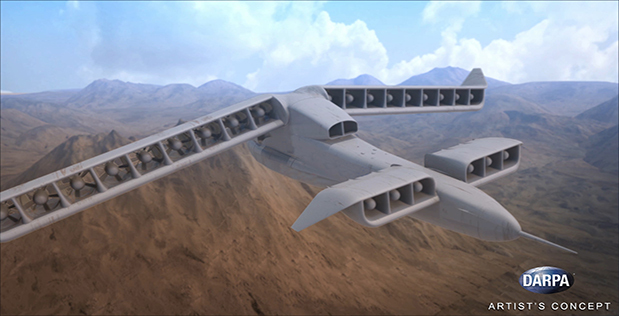 Image: DARPA’s VTOL X-Plane programme seeks to provide innovative cross-pollination between fixed-wing and rotary-wing technologies. Photo: courtesy of US Defense Advanced Research Projects Agency.